Whether music production is a hobby or a profession, being able to finish your musical ideas to a high standard is an important goal. Why? Because finished songs are your greatest assets in your musical journey. They are your primary marketing tools to show the world what you have to offer. A finished track has emotional value and will be something you can forever be proud of. A great song finished to a high standard also has considerable financial potential. An unfinished song is almost impossible to monetize and is emotionally unrewarding. This page will give you some tips on how you can finish your musical projects faster whilst maintaining a high standard of quality. As an artist, it’s advisable to get a professional to mix or master your music. This dramatically increases its value making it more marketable to labels and your audience. There is a lot of trust involved in this process. You need to trust that your engineer is talented enough to provide you with files that will sound great when heard back to back with commercially successful releases. With Bounce Boss, trust issues need never worry you again. You can upload reference tracks into your project and hear how your song compares. You also want to make sure that the mastering hasn’t negatively changed the sound of your mix; it can happen! You can level match you master to your mix and jump seamlessly between them. This allows you to effortlessly and objectively compare how the sound has changed. With Bounce Boss the power is in your hands to make sure you’re getting the best possible result from your investment in mixing and mastering services. As the artist, you’re instructing and directing your collaborators on how to achieve your vision. This is no easy task. Giving feedback through email can be time-consuming and is often unclear. With Bounce Boss you can give feedback with clarity and precision. You’ll never waste time manually finding and listing time-stamps through email again. Click and drag on the waveform to create a loop, then add your comment. It couldn’t be faster or easier. Your collaborators will see a link to immediately preview the section that your comment relates to. This removes any confusion meaning your project can progress faster. The Send Files page in Bounce Boss sets you up for success every time. It allows you to deliver the files needed for your project in a clear way to your collaborators. The reference tracks, stems, mixes and masters are clearly labeled and organized so there’s no confusion. You can also enter all the essential details your collaborators will need. 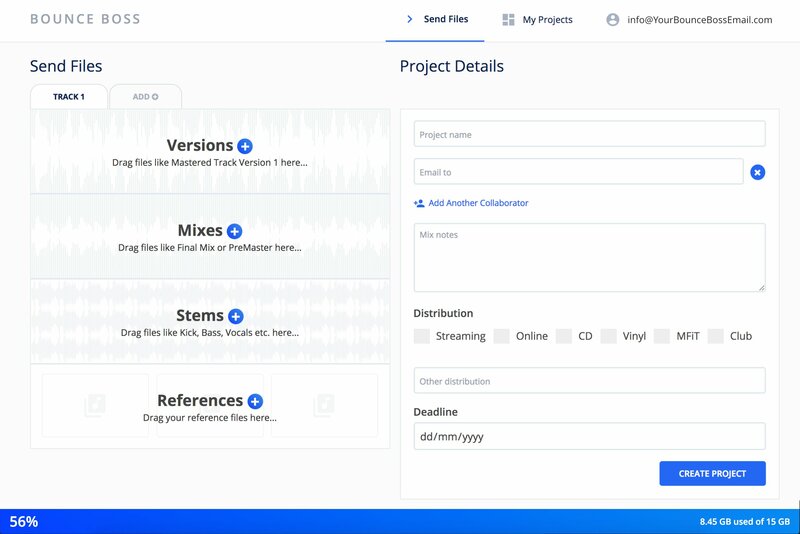 Bounce Boss prompts you to enter the mix notes, distribution and deadline so everybody involved in the project is clear about what is expected from them.